Full 4.22 engine release notes available here. This release continues to add new capabilities and improvements for using Datasmith with 3ds Max. 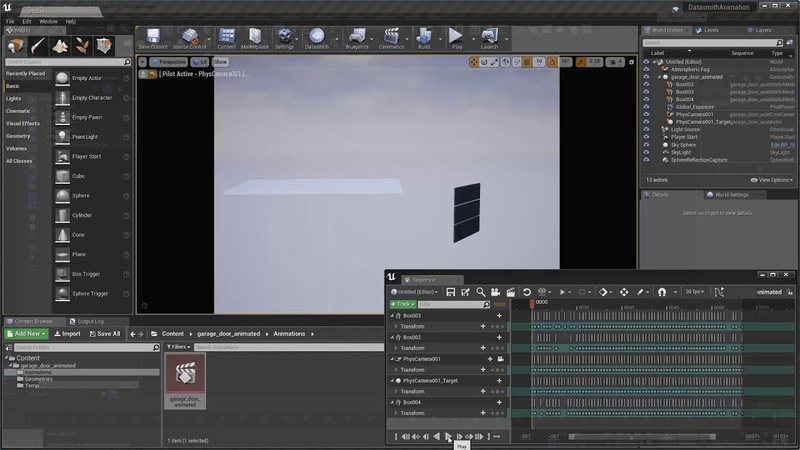 When your 3ds Max scene contains objects with animated translation, rotation, or scaling values in 3D space, you can now bring those object animations into the Unreal Engine along with the objects that make up the scene. Datasmith saves the object animations from each scene into a new Level Sequence, which it creates in your Content Browser next to the scene’s other Assets. You can use this Level Sequence to control the playback of your animation in the Unreal Editor and when you run your Project. For more about working with Level Sequences, see the documentation for the Sequencer tool. You can use the new Datasmith Attributes Modifier in 3ds Max to customize the way Datasmith exports and imports each individual object in your scene. The index of a UV channel that contains a lightmap UV you created for the object. Datasmith automatically sets the Static Mesh Asset that it creates in the Unreal Engine to get its lightmap UVs from this channel, instead of creating new lightmap UVs from scratch when you import your scene. Another object in the scene to act as the collision mesh in the Unreal Engine physics simulation. Whether you want the object’s geometry to be brought into the Unreal Engine as a Static Mesh Asset, or whether you only want the object’s bounding box to be transferred to the Unreal Engine. For details, see Per-Object Conversion Settings. In this release, Datasmith brings over to Unreal Engine more information about the physical camera attributes and global exposure settings that you have set up in 3ds Max. The intent is to make the overall rendering environment in Unreal more consistent with the source scene, so that the intensities of your physical lights produce the same visual effects as they do in your 3ds Max renders. If your 3ds Max scene contains a Physical Camera, exposure and white balance settings for that camera are now carried over to the CineCameraActor that represents that Physical Camera in the Unreal Level. The result is that when you view your Level through this camera, you’ll see light intensities that closely match the rendered result from 3ds Max. In addition, if your Exposure Control setting in 3ds Max uses either the Physical Camera Exposure Control or VRay Exposure Control, Datasmith now creates a Post Process Volume in the Datasmith Scene that applies those global exposure settings to the whole Level. The result is that when you view your Level using the default perspective camera in the Unreal Editor Viewport, you’ll once again see light intensities that closely match the rendered result from 3ds Max. This happens even if the global white balance and exposure settings don’t match the physical camera settings, as in the image above, just like when you render a Perspective viewport in 3ds Max instead of rendering from a Physical Camera. If your scene contains a Physical Camera in 3ds Max, you’ll have global Exposure Control settings active by default. That means that you’ll now get the Post Process Volume the next time you import your scene into Unreal Engine, which will probably change your visual results. If your scene is set up with exposure values that are consistent with the intensity of the lights in the scene, your scene lighting in Unreal Engine should match your source scene much more closely than with previous versions. When the light source is a rectangular area, the DatasmithAreaLightMesh now uses a Rect Light to emit its light into the Level. These Rect Lights represent the intensity and distribution of the light sources more consistently with the original results in 3ds Max. The DatasmithAreaLightMesh Blueprint now creates its Light Actor Component dynamically. This means that you don’t have to select a sub-component in order to edit the properties that control the light, such as intensity and color. You can now edit these properties when you select the DatasmithAreaLightMesh Actor in the Level. You can also bulk-edit the settings for multiple DatasmithAreaLightMesh Actors at the same time. See Area, Plane, and Volume Lights. Datasmith now imports vertex colors from 3ds Max objects, and makes those vertex colors available on the Static Mesh Assets it creates in the Unreal Engine. When you design new Material graphs in the Unreal Editor, you can use the Constants > VertexColor node to retrieve these vertex colors and use them to achieve special visual effects. If you use the Forest Pack or RailClone plugins for 3ds Max, Datasmith now uses Hierarchical Instanced Static Mesh Components to manage the instances of the geometry that you scatter or distribute procedurally in your 3ds Max scene. This should provide a dramatic improvement in the data translation performance and the usability of your content in Unreal Engine. See Forest Pack and RailClone Objects. In previous releases, Datasmith depended on the results of a tessellation process carried out internally within Rhino at the time the scene is rendered, which could produce unexpected results in the Unreal Engine — especially for scenes that never were rendered within Rhino. You can now use the tessellation settings offered by the Datasmith CAD importer to customize the fidelity of the generated Static Mesh geometry in the Unreal Engine to the original Rhino surfaces. In addition, you can customize the tessellation settings used for different Static Mesh Assets by reimporting those individual Static Mesh Assets from the Content Browser and setting different import options. See Using Datasmith with CAD Formats. Heal, or re-connect, multiple surfaces that belong to the same body or object in the source scene. When Datasmith detects that the surfaces are connected, it merges them into the same mesh element in the Static Mesh Asset it creates. Sew separate bodies together by testing for connectivity between their surfaces. This option may reduce the number of Static Mesh Assets that Datasmith creates in your Project, but takes longer to process. Skip stitching. Datasmith imports each body as a separate Static Mesh Asset, and it imports each separate surface within those bodies as a separate mesh element in the Static Mesh Asset. When you make changes to the settings of any Material Instances that Datasmith has created for your imported scenes, Datasmith now tracks those changes as overrides. You can selectively roll back your changes by right-clicking a Material Instance in the Content Browser and selecting Datasmith > Reset Overrides from the contextual menu. When you reimport a Datasmith Scene Asset, you won’t lose any of the changes you’ve made to the settings of the Material Instances used in that scene. You can now use Datasmith to import files that use the glTF 2.0 file format. The Unreal Editor also offers experimental support for importing the glTF format directly into the Content Browser using the built-in importer. However, by using the Datasmith glTF importer, you can take advantage of the same workflow benefits Datasmith offers for other file formats, such as handling full scenes instead of individual objects, maintaining scene hierarchy and relative transforms, nondestructive reimport process, and so on. To use the Datasmith glTF importer, select the new GLTF option from the drop-down list next to the Datasmith button in the Unreal Editor Toolbar. For details on the settings offered by the glTF importer, see GLTF Import Options. The Mesh Editing tools in the Static Mesh Editor window now offer better control over backward-facing triangles. By default, you can only select triangles that are facing the camera. If you want to be able to select backward-facing triangles as well, activate the optional Backfaces toggle button in the Toolbar. When you press F to focus on the triangles you currently have selected, the Static Mesh Editor viewport now scales the movement speed of the camera relative to the size of the selected area. This should make it easier to navigate the viewport while working with small parts and isolated triangles. This behavior is controlled by the Use distance-scaled camera speed setting in the Level Editor - Viewports section of the Editor Preferences window. See also Modifying Static Mesh Geometry. We’ve made some performance improvements to the Datasmith Exporter for 3ds Max and the Datasmith CAD importer, particularly for scenes with very large numbers of objects. Although we don’t have any benchmarks to share, we hope that you’ll notice that your 3ds Max exports and CAD imports take significantly less time to complete in 4.22 than you may have seen in previous versions. Switch variants by double-clicking in the Variant Manager interface. Select multiple Actors, using the Control and Shift keys, and modify all of their captured properties at the same time. Drag and drop Actors from the Level into a Variant or Variant Set, or drag them from a different Variant. Drag and drop Actors and Variants to reorder them or move them to another Variant Set, and drag and drop Variant Sets to re-order them. You can also now fire a Blueprint event when a Variant is switched on. Assign the new Function caller property to the selected properties for any Actor in a Variant. Then, set the value of that property to the name of an existing function you want to call on that Actor, or create a new Blueprint function from scratch. When you import scenes from VRED or Deltagen, Datasmith now sets up the Variant Manager to manage any variant sets and variants in those source scenes. It no longer creates a Data Table to hold information about the variants and custom Blueprints in your Level. This new approach should be more consistent and easier to use. For details on all new features in the Engine, see the Unreal Engine 4.22 Release Notes. Last edited by Stephen Ellis; 04-02-2019, 11:15 AM. Unreal Studio is an offer encompassing different software, but there isn't a single installation called "Unreal Studio". Are you still planning on updating Solidworks importing? There still seems to be quite a few issues. You didn't mention the name of the msi file, but it sounds like you are downloading either the Epic Games Launcher, or one of the Datasmith exporter plugins for 3ds Max, SketchUp or Revit. If the Epic Games Launcher is already installed, you can skip that step. Open the Launcher, navigate to the Unreal Engine > Library page (on the top bar). Click the [+] button to add a new engine slot, and choose 4.22. After the engine finishes installing, click on the "Installed Plugins" text underneath the engine slot. Datasmith might be automatically installed, in which case you are all set. Although if you are importing data from 3ds Max, SketchUp, or Revit...then you will also need to install an exporter plugin to that software. You can download them from here. any idea about railclone 3.2 to unreal studio 4.22? i am not sure what you are trying to say. are you reporting a problem or asking?